In the Western Pacific Ocean: Tropical Storm (td) 15w (Jongdari), located approximately 207 nm south-southeast of Sasebo, Japan, is tracking northwestward at 09 knots. Tropical depression 16w (sixteen), located approximately 483 nm north-northwest of Minami Tori Shima, Japan, is tracking northwestward at 18 knots. In the Eastern Pacific Ocean: Invest 93E is an area of disturbed weather in the eastern Pacific Ocean that has the potential for further tropical development. Malaysia – Flash floods have hit several parts of Malaysia following heavy rain that fell throughout the night into the wee hours of Monday morning. Flash floods were also reported in Bayan Baru, Dhoby Ghaut, Jalan Zoo and Jalan Dato Keramat. Scores of dead fish litter the shorelines of beaches in southwest Florida, and hundreds of dead and ailing sea turtles have washed up on shores there in recent weeks — all victims of a toxic red tide caused by the single-cell alga Karenia brevis. Algal blooms occur seasonally in the Gulf of Mexico, when water conditions enable their populations to explode and spread. But this year’s event includes especially high quantities of algae that produce a toxin, and the impact on marine wildlife is devastating, affecting sea birds as well as fish and turtles in unprecedented numbers. 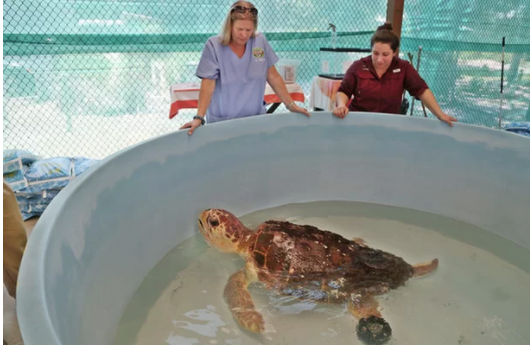 A 230-pound male loggerhead turtle was suffering from the effects of red tide. The World Health Organization (WHO) says 42 suspected cases of Crimean-Congo haemorrhagic fever have been detected in the Nakivale Refugee Settlement in northern Uganda. In its latest epidemiological analysis, WHO said the first case, involving a female who came from Rwanda through the Democratic Republic of Congo, was confirmed by the Uganda Virus Research Institute. Meanwhile, the WHO has says at least 3 out of 8 suspected cases of Rift Valley Fever (RVF) have died since the outbreak was confirmed at a farm in the Nakivale Refugee Camp on June 28. 5.3 earthquake hits off the coast of Oregon, USA. 5.1 earthquake hits offshore Atacama, Chile. 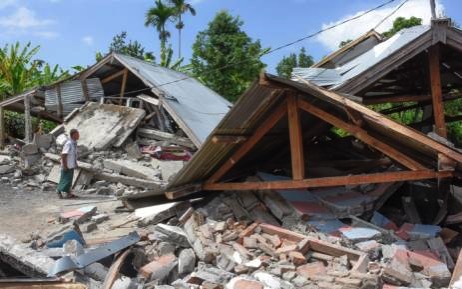 The magnitude 6.4 earthquake that struck the popular tourist island of Lombok in Indonesia on Sunday killed 14 people and sent villagers fleeing from their beds into open fields to avoid collapsing buildings. The quake, which rocked the island early in the morning when many people were still asleep, injured 162 people and damaged thousands of houses. In the Western Pacific Ocean: Tropical Depression (td) 15w (Jongdari), located approximately 169 nm south of Sasebo, Japan, is tracking southward at 07 knots. 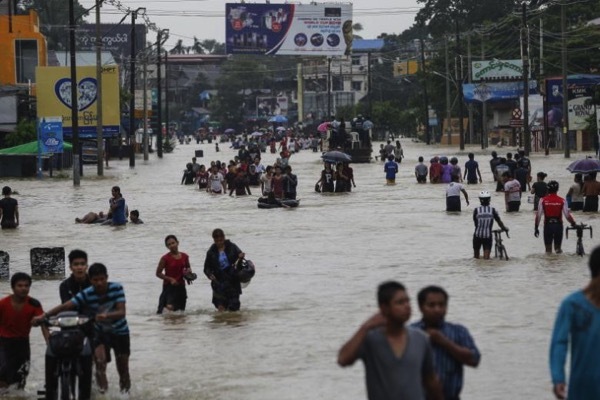 Thailand – Northeastern provinces have been warned of heavy flooding due to the overflowing Mekong River and reservoirs, following days of heavy rains. Rising water levels in Mekong River yesterday caused flooding in many areas of Ubon Ratchathani, Nakhon Phanom and Mukdahan provinces, which are located along the international waterway. In Sakon Nakhon, following five days of heavy rains, large amounts of overflowing water from small dams and reservoirs increased the water level in Nong Han Lake, which is spread over 72,000 rai (28,466 acres) in the northeastern province’s Muang district. Pakistan – Floods caused by melting glaciers continued to swell streams and rivers across Gilgit-Baltistan on Saturday, damaging houses, crops, bridges and roads. The floods have also stranded thousands of people in remote areas. Authorities said floods from melting glacier in Bazgang nullah continued on the third day on Saturday, with debris brought by it damaged over 40 houses in Tumik area of Rondu valley of Skardu, forcing residents to migrate to safe places. The floods damaged crops standing over hundreds of kanals, trees, cattle farms, causing loss worth millions of rupees. About 3.22 billion years ago, slimy layers of microbes coated pebbles in what was perhaps an ancient riverbed. Those ancient microbial mats, preserved for eons and only recently discovered in South Africa, may be the oldest fossil evidence of life on land, according to a new study. The ancient evidence of terrestrial life is about a half billion years older than the previous record holder — fossilized remains of microbes found decades ago in South Africa and Australia, said Stefan Lalonde, a geochemist from the European Institute for Marine Studies in France and a co-author of the new study, published July 23 in the journal Nature Geoscience. Geological evidence has hinted that life existed in the oceans as far back as 3.8 billion years ago. But signs of terrestrial life have been rarer — possibly because most of the planet might have been under water until 3 billion years ago. Sydney residents are set to endure poor air quality as smoke from a large uncontrolled bushfire in a military reserve spreads across the city. Wollongong and South Coast residents are also expected to be affected by smoke from the large blaze in the Holsworthy military reserve, 25km southwest of Sydney’s CBD. Unexploded military ordnance and dense bushland has hampered efforts to contain the blaze, with aircraft and firefighters told to avoid getting too close to the fire front. Instead, firefighters have begun a 4000-hectare backburning campaign, which has greatly contributed to the smoke haze. More than 50,000 people have been evacuated in Northern California bushfires that have killed six, including two children and their great-grandmother, as fire crews battled on to quell flames that have destroyed entire neighbourhoods. Officials said a second firefighter, who died fighting a huge blaze near Yosemite National Park, was among the six confirmed deaths. California Department of Forestry and Fire Protection said on Sunday that 12,000 firefighters were battling 17 significant fires in California. The Carr fire, the deadliest and most destructive of nearly 90 fires burning from Texas to Oregon, has charred 36,095 hectares of drought-parched vegetation since erupting last Monday. More than 5,012 structures were threatened by the fire, officials said. The flames destroyed 517 structures and damaged 135. In a follow-up on the Typhoid Fever situation in El Salvador, officials have reported that the cumulative case count for 2018 has risen to 937. This is significantly higher than 2017 which saw the total annual case count reach 675. 6.4 earthquake hits the Lombok region, Indonesia. 6.0 earthquake hits the Flores Sea. 5.6 earthquake hits the Kermedec Islands, New Zealand. 5.1 earthquake hits New Britain, Papua and New Guinea. 5.0 earthquake hits Kepulauan Tanimbar, Indonesia. In the Western Pacific Ocean: Tropical Storm (td) 15w (Jongdari), located approximately 27 nm southwest of Iwakuni, Japan, is tracking west-southwestward at 15 knots. In the Eastern Pacific Ocean: Tropical Depression Gilma is located about 1215 mi…1955 km e of Hilo Hawaii with maximum sustained winds…35 mph…55 km/h. Present movement…w or 280 degrees at 15 mph…24 km/h. Invest 93E is an area of disturbed weather in the eastern Pacific that has the potential for further tropical development. India – As many as 537 people have lost their lives in floods and rains in six states during the monsoon season so far. According to the Home Ministry’s National Emergency Response Centre (NERC), 139 people have died in Maharashtra, 126 in Kerala, 116 in West Bengal, 70 in Uttar Pradesh, 52 in Gujarat and 34 in Assam due to the floods and rains. The deluge and rains have hit 26 districts in Maharashtra, 22 in West Bengal, 21 in Assam, 14 in Kerala, 10 in Gujarat and a large part of Uttar Pradesh so far. In Assam, 10.17 lakh people have borne the brunt of rains and floods, of which 2.17 lakh are living in relief camps. Japan – Typhoon Jongdari made landfall east of Kyoto, Japan, just after midnight local time on Sunday, coming ashore as the latest in a long string of weather-related disasters to plague the Japanese archipelago. The weather has not been kind to Japan this month. The typhoon’s landfall comes after weeks of intense rainfall, widespread flooding, and a deadly heatwave. Jongdari came ashore in Ise Bay with maximum sustained winds near 80 MPH. The typhoon will weaken as it traverses the island nation over the next day. While the storm is rather tiny in size, some areas affected by the historic floods that struck western Japan earlier this month could see even more heavy rain from this storm. Uda, east of Osaka, recorded 4.33 inches of rain in just one hour as Jongdari made landfall on Sunday. One man is missing after several cars were washed into the ocean by high waves near Tokyo as the typhoon approached on Saturday. The devastating impact of global warming on ocean life has been laid bare in a shocking new scientific report. Coral reefs across the globe are being killed off by a combination of increasing temperatures and ocean acidification caused by rising carbon dioxide (CO2) levels. 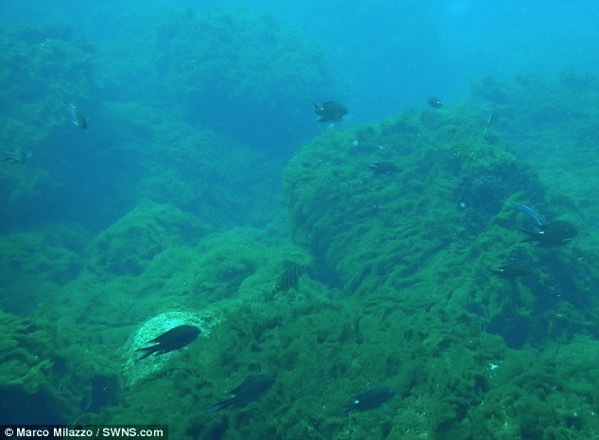 Researchers found blooms of algae are blanketing the seabed in areas of high CO2 concentration, choking corals and lowering marine diversity. If CO2 levels continue to rise at their current rate, the consequences will be ‘catastrophic’, scientists have warned. Teams of British, Italian and Japanese researchers, including from the University of Plymouth, found a worrying lack of corals in areas of the Pacific where CO2 levels met present-day averages. In contrast, marine areas with pre-industrial levels of CO2 flourished with corals and other species and sea-life. Experts discovered the stark contrast by analysing volcanic CO2 seeps off Shikine Island, in Japan, where ocean currents cause CO2 levels to mimic those before the industrial revolution. In areas with pre-Industrial levels of CO2 the coast has an impressive amount of calcified organisms such as corals and oysters. But in areas with present-day average levels of surface seawater CO2 they found far fewer corals and other calcified life, and so there was less biodiversity. It shows the extensive damage caused by humans due to CO2 emissions over the past 300 years and unless we can get a grip on reducing CO2 emissions we will undoubtedly see major degradation of coastal systems worldwide. In a follow-up on the hepatitis A outbreak that began in March in West Virginia, health officials now put the outbreak total at 699 cases, up some 160 cases in two weeks. 20 West Virginia counties have been affected. 5.3 earthquake hits offshore El Salvador. 5.1 earthquake hits the Bering Sea. 5.0 Earthquake hits the Izu Islands off Japan. In the Western Pacific Ocean: Typhoon (td) 15w (Jongdari), located approximately 98 nm south-southeast of Yokosuka, Japan, is tracking northwestward at 24 knots. In the Eastern Pacific Ocean: Remnants of Tropical Depression Nine-E is located about 1255 mi…2015 km ese of Hilo Hawaii with maximum sustained winds…30 mph…45 km/h. Present movement…w or 265 degrees at 13 mph…20 km/h. Tropical Depression Gilma is located about 1560 mi…2515 km wsw of the southern tip of Baja California and about 1560 mi…2510 km e of south point Hawaii with maximum sustained winds…35 mph…55 km/h. Present movement…w or 280 degrees at 13 mph…20 km/h. Greece – Greece has been hit by devastating flash floods — as the country still reels from the savage wildfires which ripped through the Attica region of the country. Heavy summer rainstorms over the past two days have caused flooding in several parts of Greece, including the area south of Athens. Floodwaters also forced the closure of several roads in the area. Flooding problems were also reported in the Halkidiki region of northern Greece. Pennsylvania, USA – Five days of downpours brought a foot or more of rain to an over 100-mile swath of Pennsylvania. 2 people died in the floodwaters.